"The winds of change have crossed the Alps", said Italy's Deputy Premier Luigi Di Maio after he met a senior figure in France's Gilets Jaunes, 'yellow vest' movement on Tuesday, which could increase tensions between Italy and France. Di Maio, who heads the populist Five Star Movement, showed his support for the protest group in defiance of President Emmanuel Macron and ahead of the European Parliament elections in May. France warned Di Maio against interfering in the country's politics on Wednesday. The deputy premier posted a photo after holding talks near Paris with Christophe Chalencon, a leftist 'yellow vest' organiser from the south of France. Alessandro Di Battista, an influential Five Star leader also attended. "Today with @aledibattista we went to France and met the leader of the yellow vests Cristophe [sic] Chalencon and the candidates in the European elections for the RIC list of Ingrid Levavasseur," Di Maio wrote. He added: "This is the souvenir photo of this beautiful meeting, the first of many, where we talked about our countries, social rights, environment and direct democracy. The winds of change have crossed the Alps. I repeat. The wind of change has crossed the Alps." Two of the other main 'yellow vest' organisers, who sway to the right side of politics, Maxime Nicolle and Eric Drouet, told Italy's Ansa news agency they were not contacted by Di Maio. "I can tell you that neither I, nor Eric Drouet, nor Priscilla Ludosky has been contacted. If it is confirmed, you should know that this is an autonomous initiative of a politicised party that does not represent the 'yellow vest' movement," Nicolle said. "Our movement is strictly apolitical and does not intend to present itself to the Europeans. If Di Maio calls me, I won't even pick up the phone." The visit comes in the run-up to the European elections, where Di Maio is trying to shore up support from other European allies. 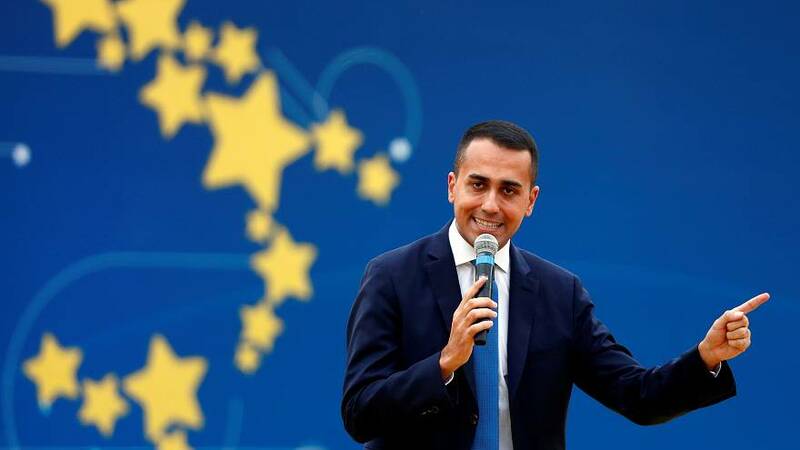 Di Maio is "making himself the left-wing populist movement alternative as Deputy Prime Minister Matteo Salvini is appealing to the populist right across Europe", said Catherine Fieschi, Executive Director of the Counterpoint political science consultancy. Tuesday's meeting was not the first time Di Maio has backed the 'yellow vests'. Last month he gave his support to the movement and has repeatedly come into blows with Emmanuel Macron over migration and Italy's budget. 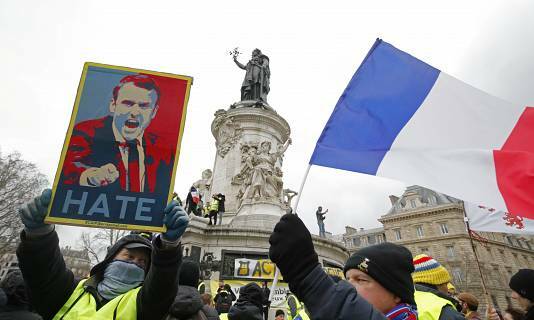 The 'yellow vest' movement has held 12 weekends of protests against Macron's government and two weeks ago announced it was making the leap into party politics by announcing a roster of candidates for the European Parliament elections. But with no official leader, there are deep divisions within the group. Part of the movement does not want to go down the mainstream party political route, others see politics as a way to get things done, and some want the 'yellow vests' to have their own identity in politics. However, there is unity on some fronts. Fieschi said: "It's not a young movement and not particularly diverse, it's a very white group of people who work and are in [the] squeezed middle class. "Many are untrusting of mainstream politics, which is why they are verbally violent against the political class and most have not cast a ballot [in previous elections]." France's far-right leader Marine Le Pen appealed to the movement in January when her National Rally Party launched its campaign for the European Parliament election. France's far-left leader Jean-Luc Melenchon has also expressed his sympathy for the 'yellow vests' and called for their support. The likelihood of the divided yellow vests supporting either of those parties is "quite low but some may already support Le Pen or Melenchon", said Fieschi. She added: "Melenchon has not succeeded in bringing these people onside as they think he's a buffoon and see him as vain and self-interested." But for France's populist parties on the right and left, the 'yellow vests' present an opportunity for them to show they are not in mainstream politics and shows they are "in touch with the people", according to Fieschi. The 'yellow vest' protests have at times been violent and have proved a political thorn in President Macron's side. "It certainly made the government panic, but not in a catastrophic way that said he [Macron] was dead and over," said Fieschi. She argues that in the European elections, the 'yellow vests' may actually help Macron as their election bid will not take votes from his party, but instead from Le Pen's or Melenchon's. "Macron will want as many "yellow vest" lists as possible," Fieschi said. A survey last month by Elabe showed that a 'yellow vest' party could receive 13% of the vote, which would extend Macron's La Republique en Marche party and would knock three points of Le Pen's National Rally and 1.5 off Melenchon's France Unbowed. Adding "if the European elections were held this Sunday, they'd get 12-13% of the vote, which isn't insignificant and more than Melenchon".